Summer is not yet here in Columbus, and homeowners still need to use their heaters to keep warm on cold nights. But spring fast approaches and it’s the best time to take care of any heating repairs that you’ve been putting off. Ensuring that your heating system is in top shape throughout the year can prevent major repairs as well as increase system longevity. 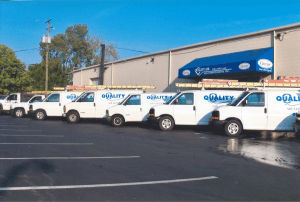 In this post, the Columbus, OH heating repair experts at Quality Air Heating and Air Conditioning have compiled a list of common repairs. For comprehensive heating services, including installation and maintenance, call us today! Thermostat malfunction. When you set your desired temperature on your thermostat, it communicates with your heater to adjust the heat accordingly. It’s your primary interface with your climate control. But if the wiring becomes damaged or it is improperly calibrated, then your thermostat can fail to perform its task properly. Inadequate heating. This is a common complaint. If you’re heater turns on, but doesn’t heat adequately then there may be an airflow problem. It could be something as simple as a clogged air filter, or it could mean a fault with the blower motor or fan mechanism. Alternatively, your ducts may have begun to crack or become dislodged from each other. This is a frequent cause of inadequate heating. Heater won’t turn on. This is commonly an electrical fault. Your heater may have blown a fuse or tripped the circuit breaker. Another possibility is that your pilot light is out. This can occur if your gas supply valve is clogged with debris, or if your thermocouple detects an issue and shuts off the ignition. If you have automatic electric ignition in lieu of a pilot light, then there may be an electrical fault somewhere within the circuit. Too much noise. If your heater is excessively loud or makes an unusual sound, there is probably something wrong with one of its internal mechanisms. Grinding is often a result of dry bearings that need to be lubricated, and rumbling can be an issue with your burner mechanism. These are just a few common heating problems. If you think you may have a problem with your home heating system, call the Columbus, OH heating repair experts at Quality Air Heating and Air Conditioning today!